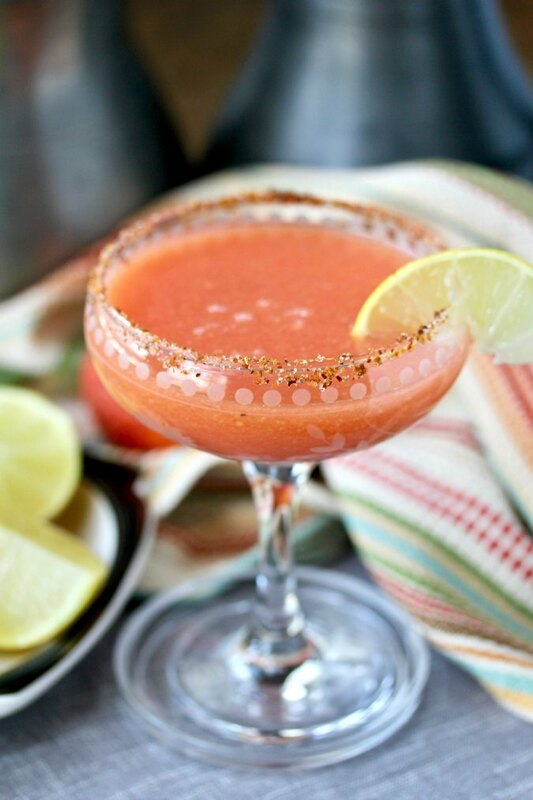 This Strawberry Papaya and Blood Orange Margarita, with pureed strawberry papayas, blood orange juice, and lime juice is such a refreshing cocktail, perfect for welcoming the coming spring and summer. You can serve this papaya margarita either straight up like I did, or "on the rocks." Let's just say, the combination of the strawberry papayas, blood oranges, and tart limes is so tasty and refreshing. Pin this recipe for your next Cinco de Mayo soiree. Strawberry papayas are sweet and juicy with a coral colored flesh. In fact, they are considered to be the sweetest papayas available. I received these papayas from Melissa's Produce, one of our Spring Sweets Week sponsors, and currently the largest distributor of specialty produce in the United States. 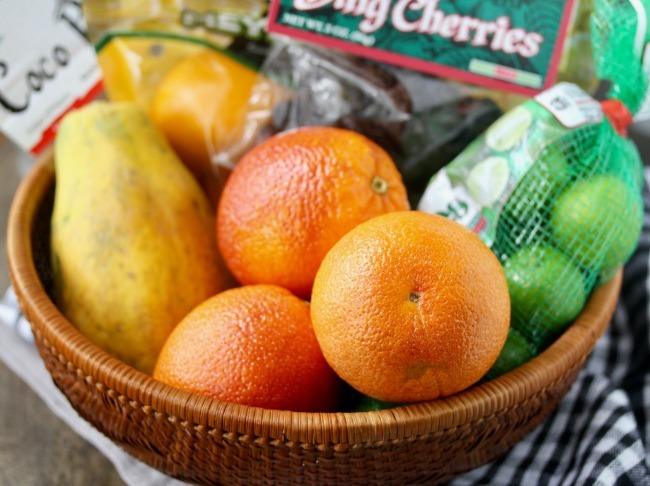 Along with the strawberry papayas, they sent me a care package full of delicious treats, including fresh blood oranges, key limes, Meyer lemons, dried fruit, some of their Clean Snax, dessert toppings, and even crêpes. I used their key limes for these Mini Key Lime Cheesecakes, and some of their blood oranges and the ready made crêpes for these Crêpes with Orange Caramel and Mascarpone. The ready made crêpes are amazing and can be easily frozen. I also used the blood oranges for a Blood Orange Sidecar Cocktail to be posted soon. Melissa's Produce is giving away a really cool Organic Family Produce Box. This box contains 100% organic fruits and vegetables including kale, cucumbers, apples, pears, lemons, oranges, carrots, onions, celery, and garlic. Be sure to enter the giveaway after the recipe. To make a papaya margarita, you peel and seed the papayas, and cut them into small cubes. Next you mix the blood orange juice, lime juice, some frozen limeade concentrate (I prefer it over simple syrup), the tequila, and some orange liqueur such as Cointreau or Grand Marnier to a blender along with the papaya, and blend until pureed. I used my favorite immersion blender and pureed the ingredients in a one quart measuring cup. I rubbed the rims of the glasses with lime juice and dipped them in Tajin Clásico Seasoning. You could also dip them in kosher salt. These margaritas are pretty special. They are frothy like a blended margarita, but not watered down. 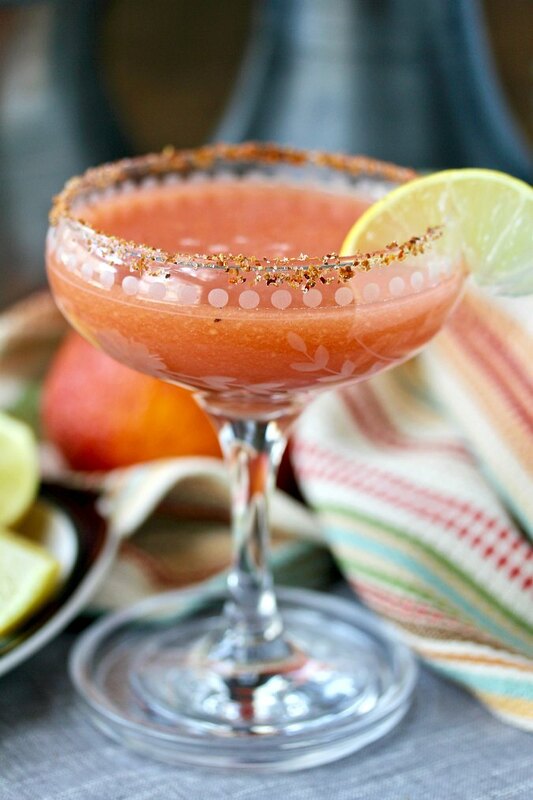 You can make these papaya margaritas with any papaya or orange. I recently made one with tangerine juice and it was amazing. Feel free to get creative. It's Day 5 of #SpringSweetsWeek. Be sure to check out all of the fabulous recipes links below, and enter to win one of 8 prizes at the end of this post, after the margarita recipe. Place some of the Tajin in a small pile on a plate, and twist the rim of the glass at an angle in the Tajin to coat it all around. If serving "on the rocks," add ice to each glass. Blend the papaya, lime juice, orange juice, limeade concentrate, tequila, and orange liqueur in a blender or with an immersion blender. Pour the mixture into an ice filled pitcher and stir to chill. Strain the mixture into the glasses, garnish with lime wedges, and serve. My mother has strawberry papayas growing in her garden. I'm definitely sharing this with her. I know she'd love it! Mmmmm this drink sounds amazing! Definitely something I need to try soon. These sound amazing! I love anything with blood oranges and the addition of papaya sounds awesome! That looks like a tropical vacation in a glass! Pour me one please! I could have used one of these margaritas earlier this evening! But I'll definitely be giving them a try once the weather warms up! These would be perfect for deck drinks! Ha ha! You are totally right about these being "deck drinks." I have a weakness for margaritas, they are my favorite adult beverage. These sound so tropical! Oooo! I'll be over soon! We can sip these on your porch and talk about cocktails! I love blood orange- and that seasoned rim sounds like on amazing drink! I would love to relax with one of these. 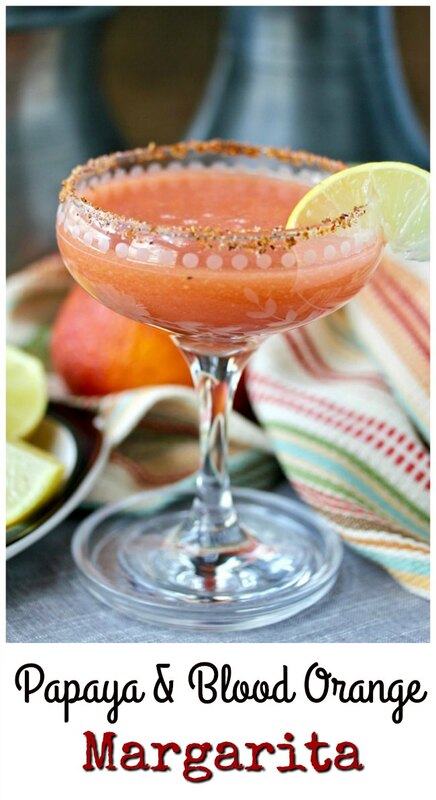 All the different flavors in this margarita sound amazing!! I have to try it! It's been a really rough week or two - so I'll take two! This is such a pretty drink and so very refreshing!